Habitat Throughout India, up to 5,400 m.
Action Fruits—diuretic, demulcent, anti- inflammatory, anabolic, spasmolytic, muscle relaxant, hypotensive, hypoglycaemic. 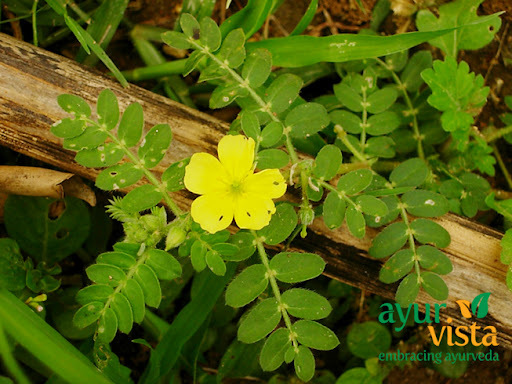 Used in strangury, calculus affections, urolithiasis, crystalluria, urinary discharges, pruritus-ani, as a tonic in sexual inadequacy; also as a supporting medicine in cough and asthma. Leaf—diuretic, haemostatic. Root—stomachic, diuretic. In addition to all these applications, The Ayurvedic Pharmacopoeia of India attributes cardiotonic properties to the root and fruit. and rutinoside, and tribuloside have been isolated from the leaves and fruits. The seeds contain carboline alkaloids— harmane and harmine. Harmol is also reported from the herb.